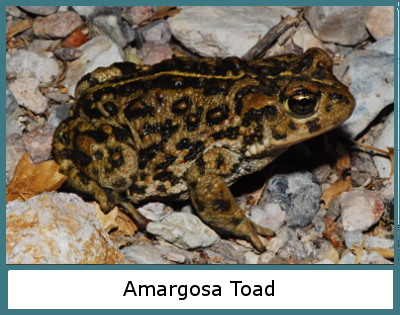 The Amargosa Toad is unique to the Oasis Valley and Beatty area. It is found in the Amargosa River, and in the seeps and springs in the foothills along the river valley. 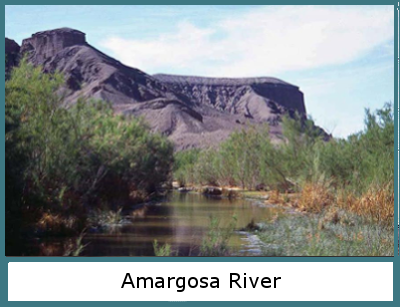 The Amargosa River is the longest underground river in the world; the headwaters are in the north end of Oasis Valley and winds south through Beatty, then (mostly underground) through Amargosa Valley. 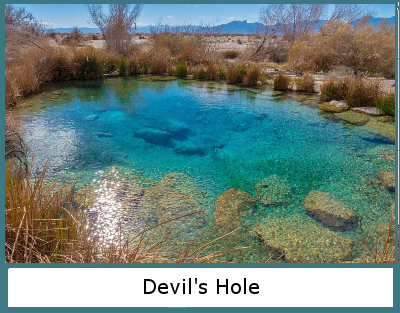 It surfaces again in Ash Meadows Wildlife Refuge, Shoshone and Tecopah, Californiia, then ends in the south end of Death Valley, California. 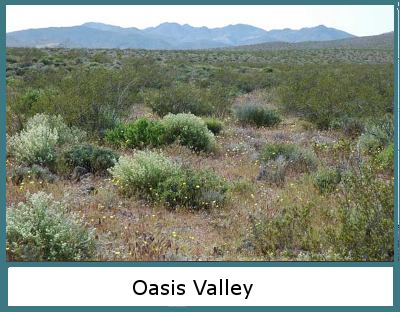 The springs and wetlands through the Oasis Valley and Beatty are ideal for the survival of the Amargosa Toad and other flora and fauna, native or unique to the area. This is also a "flyway" for migrating birds, and is the nesting-ground for numerous seasonal and year around resident birds. 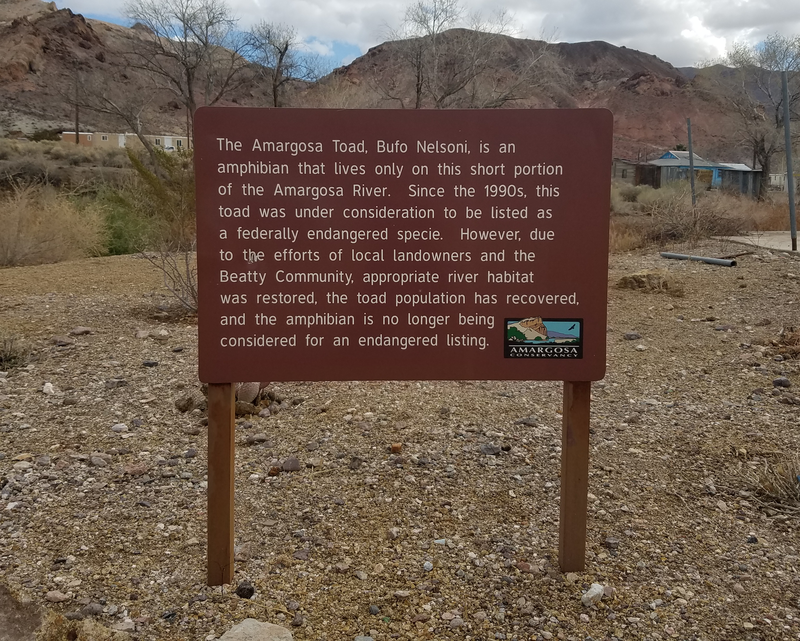 The Habitat Committee was formed by the Beatty Town Advisory Board in July of 2000 to protect the Amargosa Toad and about 39 other flora and fauna considered sensititve or threatened. Included in the goals were efforts to prevent the area being designated as an Area of Critical Environmental Concern by the Bureau of Land Management. 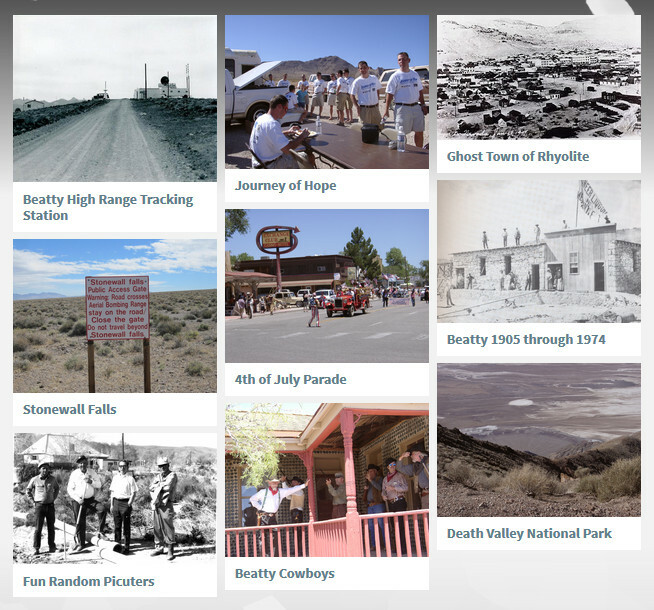 With Dr. James Marble PhD, of the Nye County Natural Resources Office as an advisor, it was soon realized the plan might be more palatable to everyone if trails through the area were added to the plan....so the Habitat Trails Project became the focus of the Beatty Habitat Committee. The idea was to create walking trails through the toad habitat areas from the "Narrows" at the south end of Beatty, through Beatty and Oasis Valey; a distance of about ten miles. The trails would be designed to give protection to the habitat, while giving recreational opportunities to townspeople and visitors. The Habitat Committee was transferred to the Beatty General Improvement District in 2006 and became a "free agent" in October of 2007. For several years, the Beatty Habitat Committee had been cooperating with Amargosa Conservancy a 501(c)(3) organization, based in Shoshone, Calif. because the goals of each group were the same; to preserve the Amargosa River, and the water that flows through it; to protect the habitat for many unique plants and animals, and to preserve the rural life-style along the river. 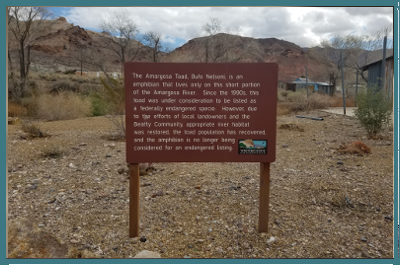 After the Beatty Habitat Committee became a "free agent", the Amargosa Conservancy agreed to become the fiscal agent for the Beatty Habitat Committee, and to work cooperatively to achieve the stated goals. The first project of the Beatty Habitat Committee, with the help of volunteers from the community, was to start cleaning up the Amargosa River flowing though Beatty. For several Saturdays, the group worked along, and in, the River to take out tons of trash, including old car parts, trash blown in, part of a burned out building (with the help of a volunteer and his backhoe), and piles of dead saplings, which were cut out of the river so not to impede the flow of the river. These trees were chipped, to be used for trail beds and mulch around future planting. Even though much trash was removed, there is still a lot to clean.